Even before I start writing this post, I have to admit that upma’s are my least favorite food to eat. I still make them as they are quick to make and works great for a weeknight dinner. My upma’s are usually loaded with vegetables like this Semiya upma / Vermicelli upma, which I make quite often for lunch boxes or it is made with whole grain like this Broken Wheat Upma. Not that I don’t make other varieties, but they are something that is less often made in my house. 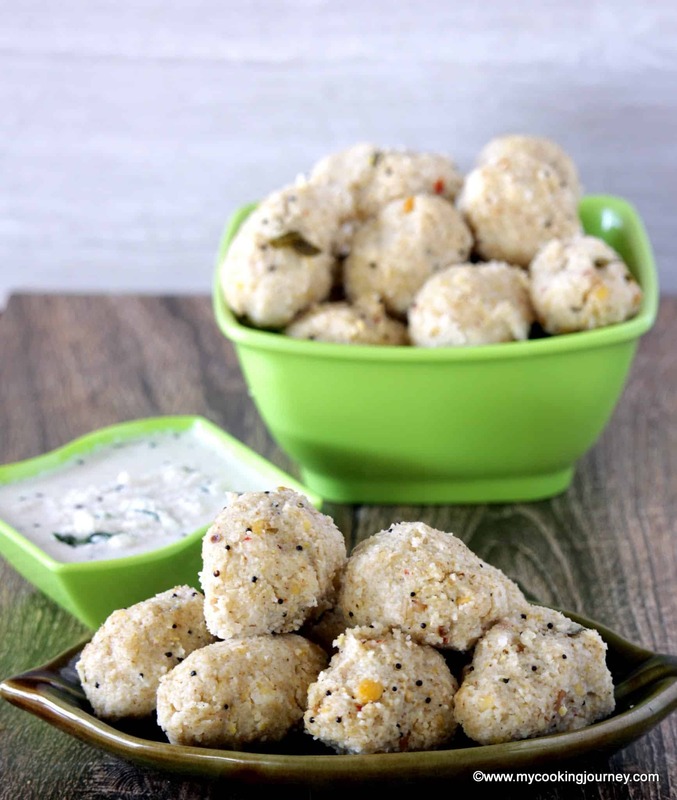 Few other upma’s that you might want to check when we are talking about them; Arisi Upma – one of my most favorite of the lot, Aval Upma – made on the most lazy days, and this idli Upma – when my household is overloaded with idli’s. 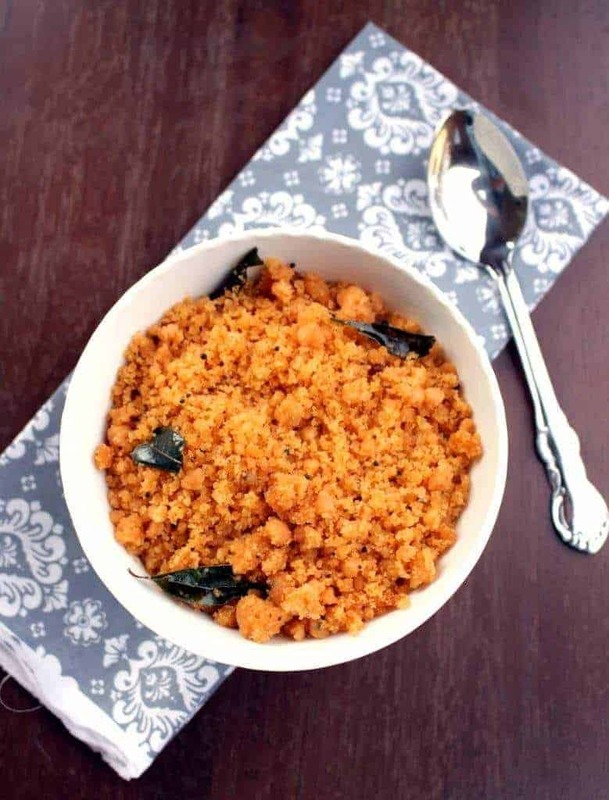 Kozhama Upma is made with raw rice flour which is mixed in with tamarind water to be made into a dough and then cooked in oil. 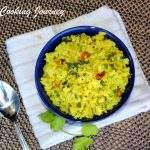 My husband loved this upma when he was growing up and has often asked me to make it. I kept avoiding to make this upma as it has no vegetables in it and it does take up quite a bit of oil to cook (and also because I don’t like Upma….). Now that my MIL is here, my husband asked her to make it for lunch one day when it was just the three of us. 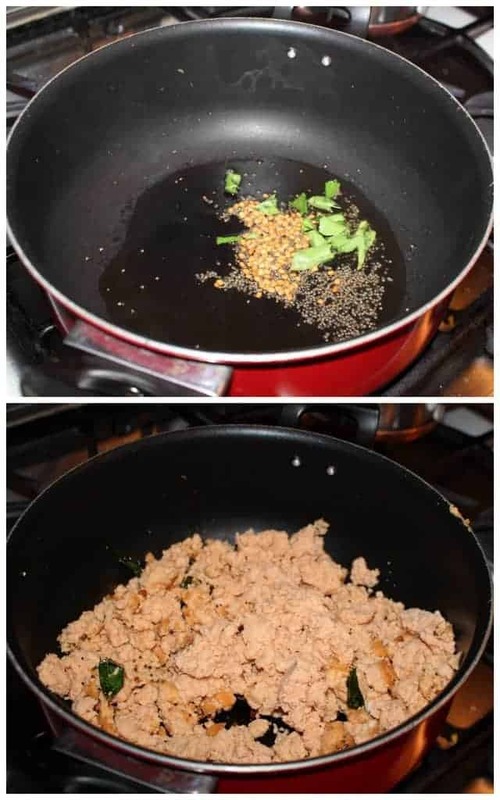 So here is mu MIL’s recipe for the upma which I captured while she was making it. The upma is quite flavorful (if you don’t mind the oil) and is pretty filling. We particularly enjoyed the crispy crust that it forms when cooking. There is another version of something similar made with raw rice flour called Mor Koozhu or Mor Kali, which I will make soon and update. 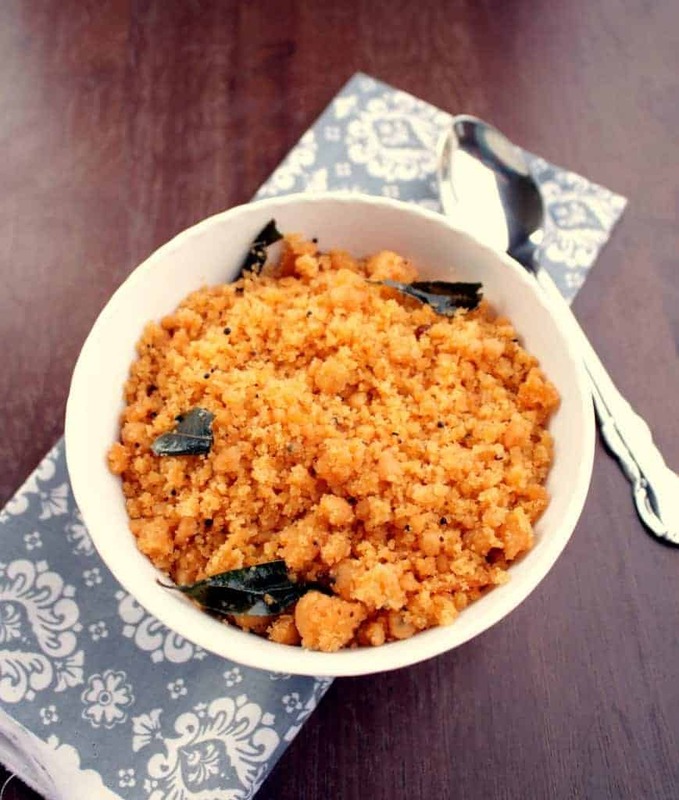 Mor koozhu is made with sour buttermilk and this Kozhma upma is made with tamarind. 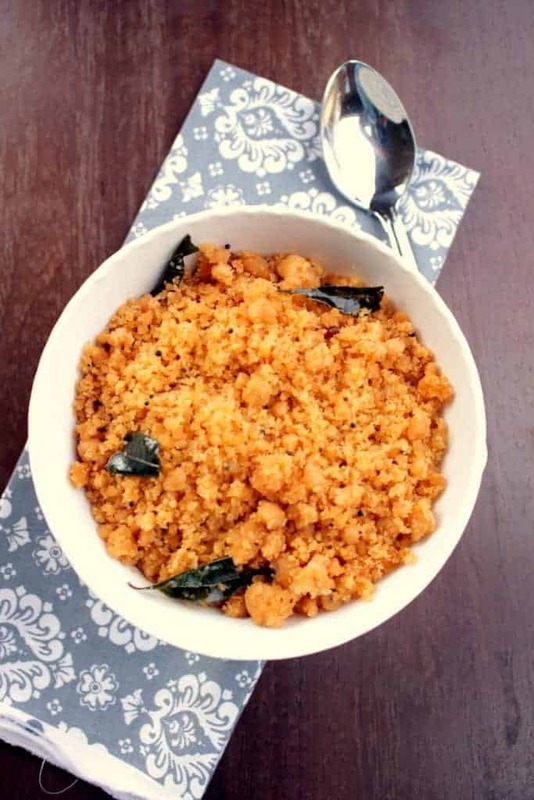 Also the mor koozhu is cooked more to be in the gooey texture which the kids enjoy and this Kozhama upma is cooked until it is all separated out and resembles bread crumbs. This week my theme for Blogging Marathon is Vegetarian lunch / dinner recipes and this is my first one in that theme. 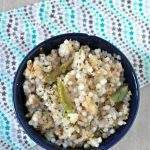 You can serve this upma with some coconut chutney or eat it with sugar like my husband does. 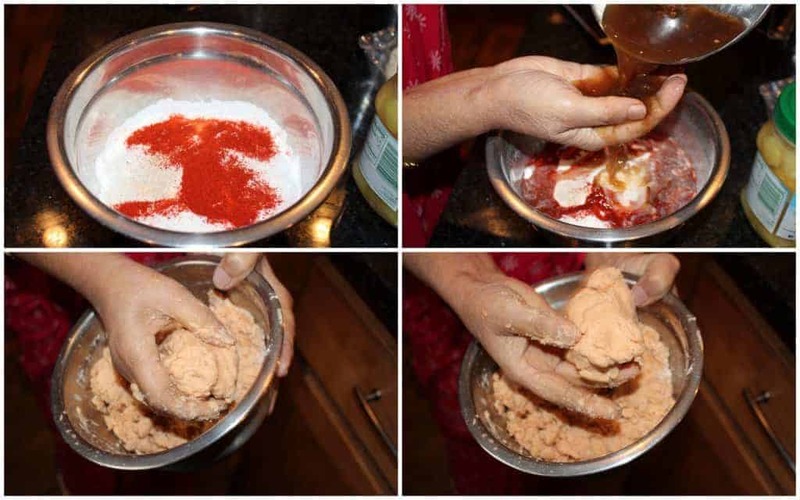 Add the rice flour, chili powder, asafetida and salt in a bowl and mix it well to combine. Soak the tamarind in hot water for about 10 minutes and then extract the juice. Add this juice to the flour mixture and combine them well until it forms a crumbly dough. The dough should hold up when made into a ball and then crumble when broken. In a wide pan (non stick or something heavy bottomed), add the oil. Add the mustard seeds and let it splutter. Now add the urad dal and the curry leaves and let it fry for about 10 seconds. Crumble the dough mixture and add it to the pan. Mix well and cook over low to medium flame. Make sure you cover the pan when cooking so the flour cooks well. Stir every now and then to avoid burning in the bottom of the pan. If the mixture is sticking too much in the bottom of the pan, then you might need to add a little more oil. 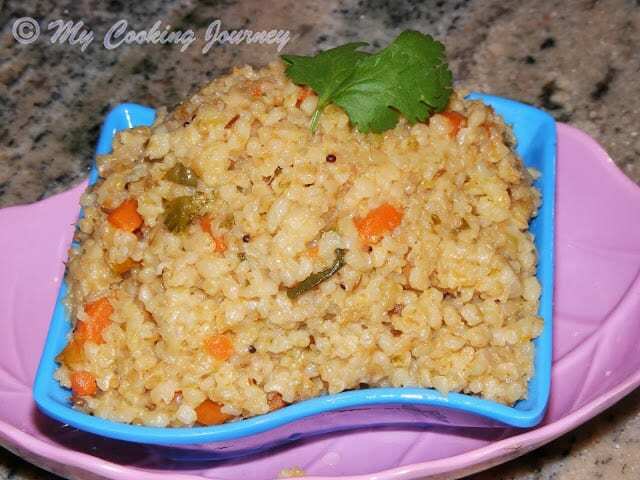 Cook for about 15 to 20 minutes or until the upma has browned up a bit and starts forming crust in the bottom. 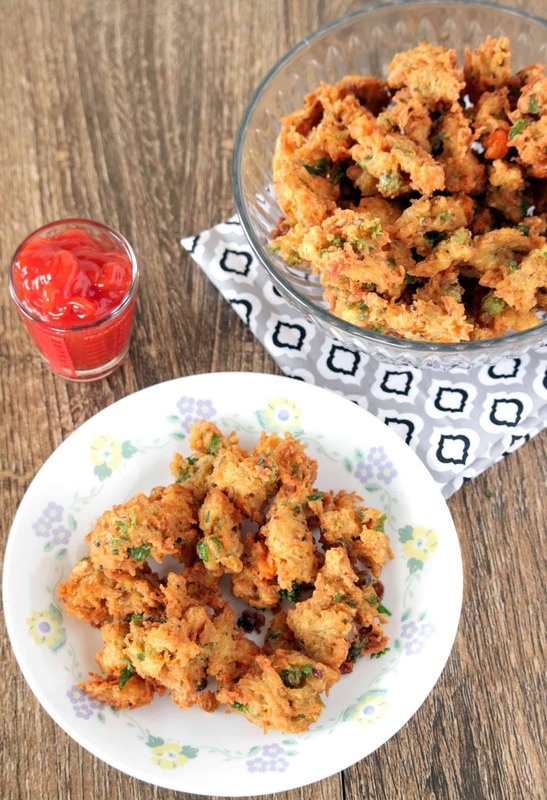 Serve warm with chutney or sugar! 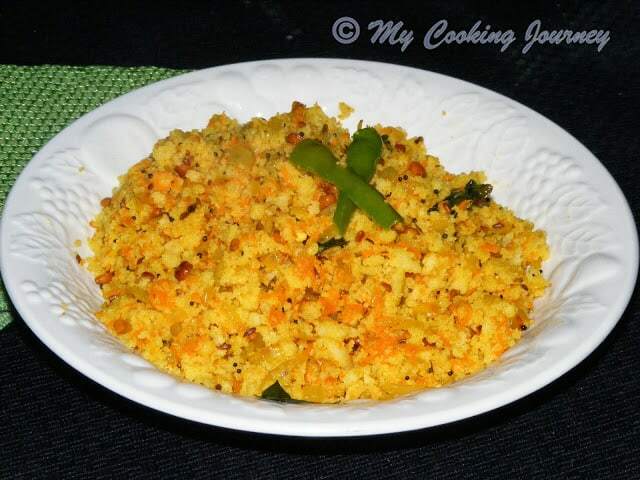 I have taste puli upma as well, but never made it myself. Will try sometime. 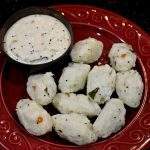 This is a very interesting upma with rice flour Sandhya. Addition of tamarind sounds delicious. 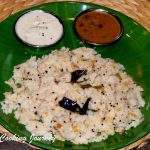 Surely looks tempting Sandhya..I won’t mind making it right now..there was a time when Upma wan’t much on the table. Even now it is not made often, but I love it now..:)btw I am not able to pronounce the name correctly..hehehe..wondering how our friends will fair..haha..
Ha ha Valli! The name is pretty tongue twisting. Let’s see what others have to say. Oil is the bummer in recipes like this, but that’s what makes it taste good as well. 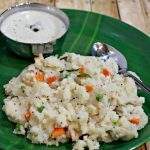 Such an interesting upma, am hearing for the first time, thanks for sharing Sandhya, now i want to give a try. I think that this was one of the favorite tiffin a generation before us. 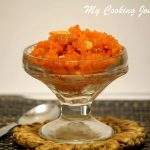 Very unique umpa recipe, totally new to me and thanks for sharing.It’s like the combination of upma and puttu. That is a pretty new one and I can see that it definitely had origins a looong time back!! Wow nice dish, new to me. Bookmarked.